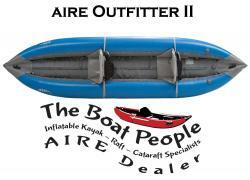 Incept's K37 Mohaka tandem inflatable kayak is a New Zealand-made kayak intended mainly for rental and livery use. In other words it falls into the "stable" and "mid-performance" category much like the AIRE Outfitter tandem. 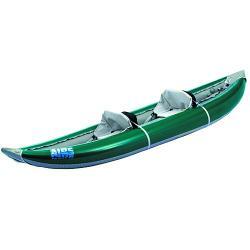 It will outhandle a number of other two person models but not more nimble boats like the Tributary Strike II. It measures a full 3-1/2 feet wide, so that keeps it from being in the high end of the performance range. For now, due to very uneven exchange rates between the U.S. and New Zealand, the pricing on all Incept kayaks is too high for us to bother stocking them, but when that situation changes we will bring them back into inventory. For now they are special order only. There are a few small attachments and D-rings on the K-37 that are glued to the hull. Given enough time, these will come unglued. Re-adhering them takes some man hours because the old glue needs to be carefully dremeled off first. PLEASE NOTE THAT YOU NEED TO CALL OR EMAIL FOR AVAILABILITY FIRST ON THIS MODEL BEFORE USING THE SHOPPING CART - WE DO NOT KEEP IT IN STOCK. Please note that any accessories purchased with your boat are 10% off, and also note that our shopping cart as yet does NOT reflect these discounts - it will show a higher total so we will adjust the bottom line before ringing the transaction through. 45 lbs. Call first - we do not stock this model so we need to check availability! 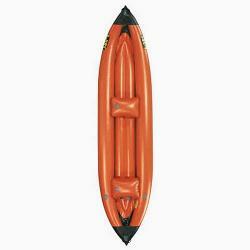 The two-person NRS MaverIK 2 inflatable kayak has increased in price to the point where it is probably not the greatest value anymore, but if you are a hypalon fanatic and want something to carry a pretty fair payload the thick inflatable floor ensures you can do so. MaverIK's are built with French Pennell hypalon. We have never cared much for the single I-beam floor design on MaverIK's. Like the bumpy, deeply ridged undersides found on the Hyside Padillacs, this boat digs hard into cross currents and can be difficult to turn quickly when you really need to. It and the Hysides are also more susceptible to hanging up on sub-surface rocks because of the lower draft. If your river makes a sharp turn, and there are wraps rocks on the outside of this bend, this model will tend to be swept into them moreso than competing models with flatter bottoms. With a little care the MaverIK should last almost a lifetime though, and that single I-beam in the floor has not been a reliability issue. In terms of rubber boats with glued I-beams, Hyside and NRS both do a great job. I-beam separations (or "hernias" as we coined it years back) are almost unheard of with these two brands. The generous 12-1/2 foot length of the tandem MaverIK allows plenty of room for two tall paddlers and the inflatable backrest pillows can be adjusted or removed as you wish. These are made in Tecate, Mexico and the color choice is blue or red. Grey won't be an option this year. Leafield valves on all five chambers, with stainless 2" D-rings at each end, and handles too. NRS has increased the warranty period for private boaters to ten years, perhaps in trying to keep up with AIRE, though we have to note that AIRE is still the only company that fixes damage free of charge on their American made products. Solo MaverIK's (one hundred dollars less) are also available by special order.